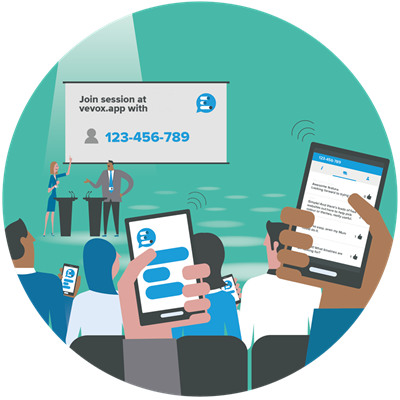 Dig even deeper into the data you collect with Vevox by downloading your session report, available immediately after each session. Your Vevox session report takes the form of an Microsoft Excel file which contains separate worksheets. Each worksheet shows a summary and detailed results of attendance, poll results, survey results and any messages, comments or questions submitted to the Q&A board. This report is yours to splice and dice the data any way you want. If you have chosen to set your Vevox session to Anonymous, your report will still generate but all participant names will be replaced with 'Anonymous'. When you use Vevox's anonymity feature, sessions are truly anonymous, there is no way to identify participants and their answers. To download your report, click the 'Data' tab in your dashboard menu and click the 'Download Report' button. You can even save your polls or wordcloud data as images instantly. For more info see our help center. Review each report to understand what participants understood from your session. Save your reports and compare results over time to identify trends. Use the insights you uncover through your session data to make informed decisions. Our correct answer feature is helpful for discovering knowledge gaps that you didn't know existed... Now you can fix this!